The 1980s was the time of the perm. These days, you don’t hear about many people getting perms. However, perms do seem to be making somewhat of a comeback lately. Some Hollywood stars are getting perms and enticing others to try a modern perm. Perms became popular in the ‘80s when women were starting to become bolder and wanted a bold hairstyle. The modern perm is more of a permanent wave, rather than a tight curl. Modern perms are also more customized for each person. 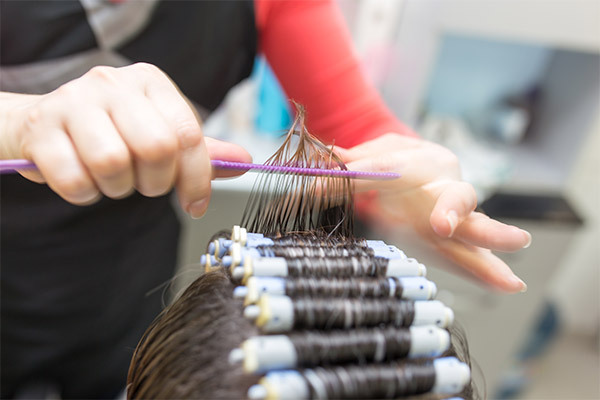 If you go to a professional hairstylist, they will customize the rod size and the way they are placed for your specific hair type and the style you are going for. If you want a more natural beach wave or a tighter curl, that will depend on where the rods are placed. Perms can also help defrizz your hair. Perms work on just about every hair type and texture. These days you can even get a perm if you color your hair. In the past, these two processes were too much to be done around the same time. Getting a perm can take a while. Depending on your hair length and type, it could take about two hours or more. Two days after your perm, you are allowed to wash your hair and you will be able to see your waves or curls dry naturally. You can heat style your hair as well if you choose to. A perm should last about six months. It will grow out naturally. What do you think about perms? Would you consider getting a modern perm? Did you realize that they still exist? Unfortunately, the perm solution still smells quite strong! If you enjoyed this article, please SHARE with your friends and family who are considering a perm! This entry was posted in Featured, Hair Styles, Hair Trends and tagged defrizz, hair perm, perms. No I would not get a perm the last one I had a few years ago left my hair frizzy and it grows back frizzy and I hate it. Im a Keranique user since January 2018 and the results of my hair growth is incredible. Because it was said that when under this treatment a perm is out of the questions. Is this true? If not…Do Keranique carries this product. Please awaits for answer. Don’t you think that perms are damaging for people with thinning hair? Would you discourage people from getting them? I have curly hair and there are better methods for reducing frizz (see Curly Girl Method). I think those chemicals are too strong for already weak hair. That is just my opinion, having grown up with two grandmothers who were beauticians. That smell is enough to make you cringe. I use Gentle Treatment Perm (regular strength) only when needed. I feel comfortable with it. Will Keranique ever make perms for black hair? Please cancel my participation in the hair regrowth system. My doctor advises that I discontinue. A customer service rep will reach out to you soon. I get a perm one time a year and I do my hair myself and my hair and it grew back good when I get it cut .The year I get the perm.Yes I know my daughter and a friend stop getting perm so for me it ok.
Hi Candy, Keranique Regrowth Treatment with 2% Minoxidil contains the only ingredient FDA approved to regrow hair. Although Minoxidil has been clinically proven and FDA approved, it can have some negative affects on some health concerns, which is why we recommend that you speak with your physician prior to using Keranique Regrowth Treatment if you have a medical condition that you think may be an issue. Hi Candy, thank you for your interest in Keranique!! We recommend you talk with your doctor or dermatologist about using the System if you have a medical condition that you think might be an issue. 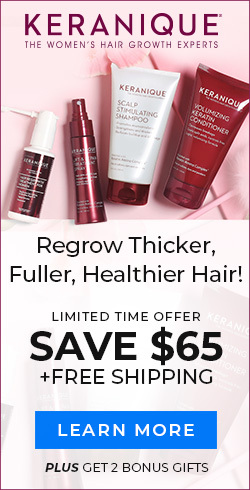 The Keranique Hair Regrowth Treatment includes topical 2% Minoxidil, a clinically proven, FDA approved ingredient to regrow women’s hair that has been in use for over 25 years by millions of women around the world. Can I get a perm and still use your products? Hi Helen, absolutely, we have many happy and successful customers who have chemically treated hair! Keranique Regrowth System is free of dyes, sulfates, and parabens. In addition our Scalp Stimulating Shampoo and Volumizing Keratin Conditioner have not only been formulated to be gentle on chemically treated hair, but they have also been clinically tested and proven to be gentle so they won’t strip or fade color. For best results, we recommend skipping Keranique Regrowth Treatment the day before, the day of, and the day after you chemically treat your hair. Hi Neelam, we recommend checking Ulta Beauty stores and Sephora Boutiques located in JCPenney stores for Keranique Revitalizing Shampoo and Keranique Volumizing Keratin Conditioner!